This was my last day as Guest Designer for Everyday Cricut. I want to give a GREAT BIG thank you to Joy and Melanie for having me visit this week! Please make sure you come back tonight to my Blog for the My Pink Stamper Monthly Blog Hop! For my last project I wanted to do something for St. Patrick's Day. You can't have a last name like McGuire and not do something for this day! I'm Greek but my husband is Irish...ever see My Big Fat Greek Wedding?? Well basically, that is my life! We really only acknowledge the Irish part one day a year and that is St. Patrick's Day. I do the whole corned beef and cabbage thing every year but, of course, I add a whole head of garlic...sometimes more, LOL! to the corned beef just to add that little Greek touch to it :) I made this card for you that will be on it's way to my Father-in-law--I hope it puts a smile on his face! I wanted to do something a little different for you today so I did a waterfall card. If you have a Gypsy, I'm giving you the Gypsy file so you can make one quick and easy. You can get the file HERE. If you don't have one, I will post the dimensions of the cuts. The base of the card is just basic rectangles from George. The white is 5" x 7" and the green stripe is 6.75"x 4.75". On the green, I welded in some shamrocks and used the negative as my mat. 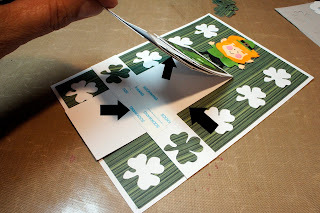 Save all those little shamrocks because you will need them later in the card. The first thing I did was cut the leprechaun for the card. I shared this tip last week, but I thought I'd share it again for you here. If you have an Imagine, you can color all these pieces and cut them the Imagine. 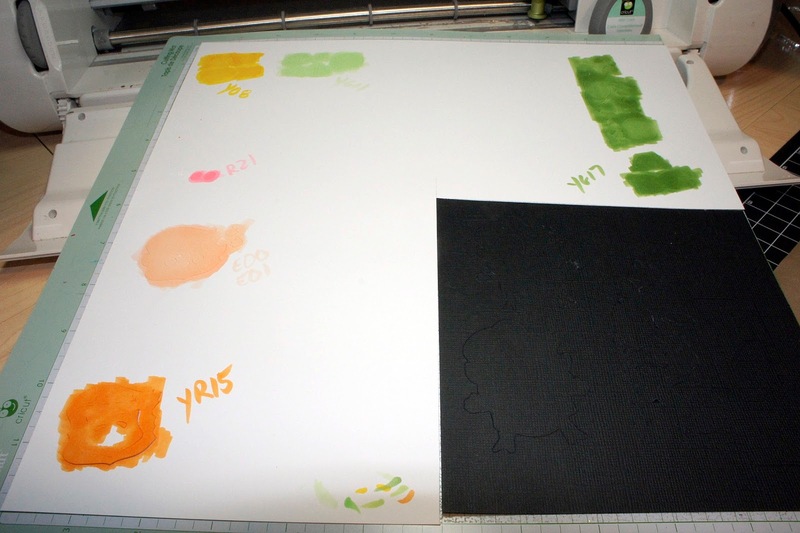 But, if you don't, an easy way to color your little cuts all at once is to cut them on white card stock and color them all at one time. In this case, I used my Copics, but any markers or colored pencils would be great! (1) 2" x 9" piece scored at 2", 2 3/4", 3 1/2" and 4 1/4"
Fold the 2" x 9" piece in half at the 4 1/4" mark. Assemble the mat squares together. You will be placing one of each of the four mats on the score marks right beneath the score line (as close as you can). Next step....adhere your 1" x 5" mechanism bar across the card, only using adhesive at the very left and right edges. Then put double sided adhesive right in the very middle of the bar (on top). Slide your waterfall mechanism behind the bar (the part that is not scored) and adhere the scored part of the mechanism down onto the bar. The waterfall works by pulling the mechanism down. I added an eyelet and twill to make it obvious to the user to pull. I hope my instructions are clear. It really is quite easy if you put the adhesive in the right places :) If you have any questions, just let me know and I will try to better explain to you..or better yet just Google Waterfall Card. There are tons of tutorials out there on YouTube that will show you up close. So...that is it! My week has come to an end over at Everyday Cricut. I made a Gypsy file to share with you to make this card. 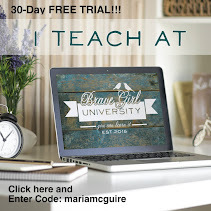 I also have a give-a-way here on my Blog today for you. I am giving away a Cricut Sampler cartridge. I will also be having another give-a-way on my Blog today after 8pm Central time. It is our Monthly My Pink Stamper Blog Hop. Please come and join me and our other talented My Pink Stamper Design Team members in the challenge for this month. I will pick a winner for a My Pink Stamper Stamp set for the Blog Hop post. George and Basic Shapes = squares and rectangles--sizes above. 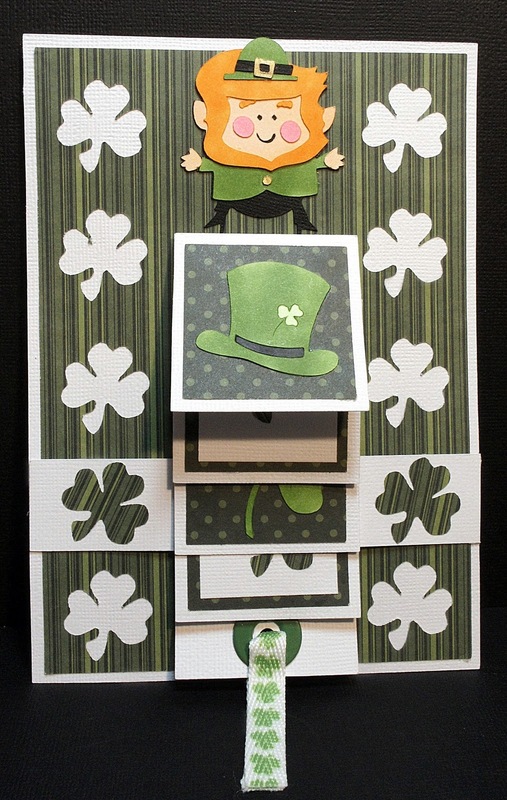 Paper Doll Dress Up = Shamrocks 1.0"
Simply Charmed = Leprechaun @ 2.18"
Celebrate with Flourish = Luck of the Irish @ 1.42"
A Child's Year = Shamrock 1.59" & Top Hat 1.24"
What a great card, you are so talented. I downloaded your file. Thank you so much! I went back through them all, and they are all great, but my favorite is the Mother's day one! Everyday Cricut Day 5 - My favorite post this week was the Mother's Day Card. I am intrigued by the Viva Decor Pearls and what a great effect they are on your card. TFS. a great waterfal card you made. Thank you for showing!!! Although I've loved everything you've created this week, I think my fav is the Toy Story layout. Have you ever thought about 81/2 by 11 layouts? Just wondering . . .
All of your projects have been great this week! I think I most like the Toy Story layout! The embossed frame is awesome! Thanks for the chance to win the Cricut Sampler cartridge! I love all your projects but I have 2 favorites. The Toy Story layout because like you it was and still is a HUGE part of our life (2 boys) and the bee card. I love all the texture you used! And you gave me the idea with making your postage stamp card base. I really need to make my own bases also!! It's been a great week! My favorite post was the Mother's Day Card. My second favorite is St. Patrick's Day waterfall card. You've inspired me to try one too. Thank you! I absolutely love love love this card! And I want to thank you for the tip on cutting things out in white and coloring them myself... this sounds like such a simple idea, but I've never even thought of it! And there are so many times when you want just that perfect shade of skin color for something and it's so hard to find paper to match it, coloring would be so much easier! Thank you so much! I loved all of your projects this week on Everyday Cricut! If I really have to pick a favorite, I think I will have to go with the Toy Story layout. It takes a place in my heart as well because of the love my boys have had with the movie and the characters. They all grow up way too fast! Thanks for sharing all your fabulous ideas this week and the opportunity to win! Thanks for all of your projects this week! My favorite was definitely the Toy Story layout. I definitely love seeing all the scrapbooking layouts to get some ideas for my own! Thanks for sharing. This is my favorite post. I love St. Patrick's Day. All of your posts have been wonderful though. Thank you for sharing! Maria, you've done a great job this week. It's hard to pick a favoite project, but I have to say it is the shine layout. In fact, I shamelessly scraplifted it and made one! I made a few adjustments (some due to errors on my part), but it turned out very well. Maria, all I can say is "WOW" I hate to see you leave your work is awesome....My favorite piece was the Toy Story LO....the page came to life and your work with the characters was unbelievable and loved your embossing techniques...I also loved your cutting tips for Disney cartridges....your explanations are so perfect....I must say you made it very difficult to pick a favorite. gosh.. to pick a fav for the week.. day 1 & day 4 are my favs BUT I LOVED all week of inspiration and more WANTS/NEEDS of cartridges I have to have!! Can't wait to follow ur blog for more. I won't be able to see live the blog hop tonight (prior commitment of eating for a fundraiser.. go figure.. priorities) LOL but will view it later. PS... Thanks for helping Robin.. I cant decide between day 3 or day 4..... those are just too adorable!!! But I guess I can pick them both as one is a card and the other a scrapbook layout!!! Maria, You did such an AWESOME job at Everyday Cricut this week. You are so talented and I loved everything you did. I became a new follower and my fav was the Toy Story LO! It is SO CUTE! Thanks for the great giveaway! well it is hard to choose... but my favorite would be the toy story layout.... because the layout is most beautiful!!! and i loved the story that goes with it... which made the lay out more precious.... for me that's what it is all about the story that goes with the art!!! well i will keep on following your blog, and wow i would love to win this cartridge!!! I have loved all your projects ! I think my favorite is the toy story layout..having teenagers myself..buzz and woody were their favorites !thanks for the chance to win ! I have often wondered how to do a waterfall card, thank you for the instructions! My favorite project was the St. Patrick's Day card. Awesome card! Of course, being Irish, I might be a little biased. This card was my favorite as I have been looking for a pattern to make the waterfall cards. Thanks so much!! I absolutely love the waterfall card that is today's Day 5 project!!! How creative and how beautiful! I am no where near this level of card making but I sure love to look at what other folks are able to do!! Thanks for the inspiration and for the chance to enter your contest!!! I have to say that the Howdy Partner layout was my favorite of the week. I just fell in love with it when I saw it and I don't even do scrapbooking! Second would be the great Bee card, since i am a cardmaker and it is so cute. Thanks for all your inspiration this week. I love the Toy Story scrapbook layout! It looks absolutely wonderful. I need to start pulling out some of those old pictures I have and start scrapping again. Everyday Cricut Day 5- my favorite project was the "Bee Happy" card! The wings on the bee's did it for me. I've loved all your projects it was pretty hard to pick a favorite! Love the waterfall card. Your directions seem so simple that I am tempted to try one myself. Thanks for sharing your talents. Oh Maria I just love this St. Patrick's Day card! Thanks so much for the cut file. I've been wanting to make one of these cards for a while and this one is just perfect! 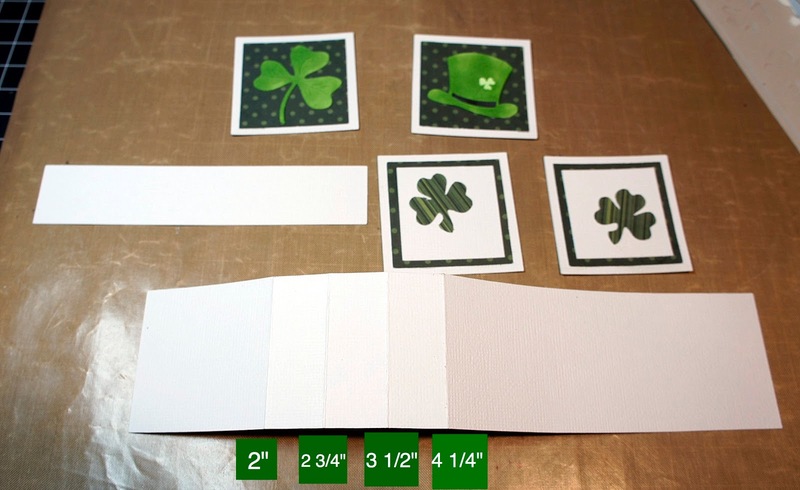 I'm making several St. Patrick's Day cards this weekend (lot's of Irish for me!) and this will definitely come in handy! Thanks so very much! I love the Toy Story project the best! Thanks for the tip on leaving layers on the mat until you're ready to adhere a specific layer. I'm new to the bug and G and wouldn't have thought of it. Thanks for the give aways and all your great projects. I love this St. Patrick's Day card. I'll be making a few of them this weekend for the grandkids. The tips are great. Great project! Totally love it and I have enjoyed following your projects! This is a very cute card TFS and thanks for the chance to win this cart. Thanks alot, cant wait to try! I think all of the projects are pretty sweet and can't pick just one. Appreciate the tips and inspiration! Been a busy week playing with my gypsy and limited amt of carts! It's pretty amazing what you can do with a few carts and the gypsy! Great card today. I love all your projects you shared this week but my favorite is the Shine layout on Tuesday. It reminds me of my granddaughter that just turned 19. She is a sweetheart. Thanks for sharing all your projects and thanks for the Gypsy cut file. I enjoyed your projects this week. I am sure Joy and Melanie will want you back again because your work is beautiful. Thanks and I am a follower. If I had to pick just one it would be the waterfall card. I just love making cards that are not the standard. I loved all your projects over at Everyday Cricut, but I think the Toy Story layout was AWESOME. It really packed a punch. Thanks for sharing. Love the Toy Story layout. It's spectacular. Also, thanks so much for the tip about leaving the items on the mat after cutting. I didn't do that with Woody and Buzz Lightyear - I hate to admit how long it took me to figure out where everything went! Love the layout. My 2nd favorite is the St. Patrick's Day card - awesome. Everyday Cricut Day 5 - I loved all your projects on Everyday Cricut but I think my favorite is the Toy Story LO, its so fun and such a great story about your son behind it!! I have 2 little boys, so I cried at Toy Story 3 as well!! Thanks for sharing a great week of projects!! What a great job you did at Everyday Cricut this week. Your projects were adorable!!! Thanks for sharing them. Super job!!! Enjoyed your projects this week! I especially enjoyed the Toy Story and waterfall project! I love day 2 's layout!! But all of your projects were awesome!!! Everyday Cricut Day 5 - All of your projects this week were wonderful and the tips you gave were greatly appreciated. My favorite is the Shamrock waterfall card. I am Irish and have been looking for a card design to send out for St. Patrick's day to my family. The Shamrock waterfall card is perfect. Wanted to do a waterfall card for Christmas, but couldn't make it work. Now I will be able to use the technique again. Thanks, again, for being here this week. Definetly my favorite is day 3... The bee happy!! I can't wait to make it, but I don't have all the necessary materials. It simply makes you happy to see it :-). Thanks!! Well it was really a toss up between Toy Story or the Bee card. My choice is the Bee card. Great week. All of your layouts have been awesome, I have two favorites, (if that is allowed) today's, the St. Pats day and the postage stamp bee. I read all these blogs and get so many great ideas that I want to try when I get the many different cartridges. As a newbie, I am still collecting cartridges and other supplies necessary to create. Thanks for sharing so many wonderful projects this week! Hard to pick a favorite! I love the layout with your daughter, and the ti pon making cards by welded in the Bee card. But I don't have the Gypsy or software to do that, so I'm going with the Toy Story layout as my favorite. The wood is brilliant, and the tip on leaving all the pieces on your mat is great! Thanks so much for sharing your ideas this week. I loved all the projects this week, but I think my favorite would have to be the Toy Story layout. I love the way you made the frame look like wood, so realistic. Overall, it's just adorable. Love the Toy Story layout, Maria. I had to order a woodgrain embossing folder after I saw the frame on the layout! Ha! Thanks for enabling and inspiring this week. Everday Cricut 5 - I loved your waterfall card. I've seen them before but never saw a tutorial like the one you wrote. Thank you. Thanks for sharing your creations over at Everyday Cricut... if I had to pick a favorite, I'd say the waterfall card and the Toy Story LO. I'm not a scrapbooker, but you may have converted me with that one!! Do I really have to pick a favorite! All your projects are awesome, but I really love the Mother's Day card. I think because of all the different elements. You are an awesome designer! Thanks for the inspiration! I am sooooo new at this stuff, it took me almost 20 minutes to figure out where and how to post. I would like to say that all the designs for this week were fun and bright and fabulous, but I gotta say the St. Patrick's waterfall card was the best. Very creative, bright, cute and I like the interactive part the best. I have a book with instructions on how to accomplish this card technique but have been too intimidated to try it. Not anymore! Your innovative card has inspired me to give it a whirl! 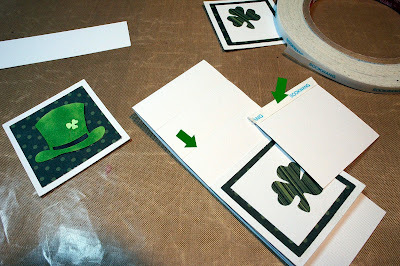 Everyday Cricut Day 5- I loved the St Patrick's Day project because I love idea of the "flip-ups"...very unique & creative idea! Thanx! Loved them all but I too married into an Irish family so today is my favorite! I also love to make the waterfall cards - thanks for the layout! I will be adding garlic to my once-a-year-corned-beef-and cabbage!! Sounds awesome! I really liked all your projects at Everyday Cricut this week . My favorite is your Imagine layout of your daughter but then ther Toy Story one is running such a clos second that I have to mention it as well. My favorite was the "Shine" scrapbook page. I'm a cardmaker myself, but I have a great appreciation for scrapbookers! My favorite cartridge is Storybook, so I was glad to see it appear in your project, and I loved your feminine colors. And I almost forgot! Chandeliers w/ bling are awesome, too! WOW! 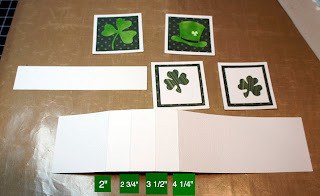 It is so hard to pick the one I like best...the bee card was simply gorgeous, Toy Story was awesome (have pics of my little granddaughter dressed like Jessie and this page would be perfect), but since I'm full blooded IRISH, I guess I have to go with the Everyday Cricut 5 IRISH card. If your fil doesn't appreciate it, send it to me...it'd sure put a smile on my face. What a great card! Thanks for explaining how to do it and the file! It's been a great week and loved your projects! THANKS FOR BEING HERE!! Thank you so much for all the wonderful projects you posted on Everyday Cricut this week. My favorite was your Bee Happy card, bc you gave encouragement to mix it up! Some of us get stuck on using just one cart and one button. This really shows how all the carts can work together to create something amazing and unique. Thanks for the chance to win this cart!!! Absolutely love this card. I will definitely be downloading this file. Thank you! I didn't know there was such a cute leprechaun on that cartridge. The Toy Story layout you did is just adorable too. Sometimes I wish my boys were younger. You are very talented with the Cricut! I really liked the imagine layout of your daughter. It is just gorgeous. Now I don't forsee me getting an imagine, so the project that I liked the most that I can actually make is the waterfall card because it is different. I haven't used my gypsy a lot and don't really know what to do with the cut file, but I will play with it and try to figure it out. Thanks for your projects this week! My favorite has to be the "Bee". You are a fabulous designer! I have followed you all week on Everyday Cricut and love all your work. I especially like the way you're not afraid to change things up like you did when you added the texture to your Toy Story frame and when you colored your pieces for your St Patricks Day card. Love, Love Love your work! It's been a pleasure having you in my email every day this week. I love your creativity and new techniques you have brought with you. I look forward to being a follower of your blog too. Thanks for sharing with us. I loved seeing all your great projects this week at Everyday Cricut. I think that this waterfall card is my favorite of your projects :) although it was a tough decision. Thanks so much for the chance to win and for sharing your creativity with us all! You have had some really fabulous projects this week. I do love this waterfall card. I would love to give one of these a try sometime. Thank you for the tutorial and all the fabulous ideas you have shared this week. I just got my Cricut and haven't used it very much but you have given me lots of inspiration. Thank you for the chance to win. I love the Toy Story project that you did!!! My daughter is absolutely CRAZY about the characters from Toy Story.....I may need to give it a try! I really anjoyed your visit at EC and loved all your projects. I would have to say my favorite was the Bee Happy card though, so cute and cheery. It is soooo hard to chose from the 5 days. But I have to say I love Day 5. St. Patties Day is near and dear to me. I love the instructions on how to make the Pop Up card. So Day 5 it is. TFS!! 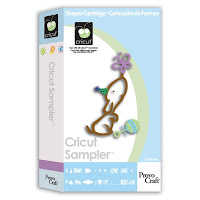 Cricut Sampler 5. its hard to choose which one I like best, they are all so cute and amazing. However, in a house full of 3 little boys we are obsessed with Toy Story, so I would say Woody and Jessie are my favorite! I was in awe with how you did that, so cute! I came over from Everyday Cricut Day 5! I so loved the Imagine layout of your daughter. It was so beautiful!!!!!!!! Thanks! It's hard to choose but Howdy Partner is my fave. Owsome card love the little guy so so cute. Your layouts are beautiful! Thank you for being a guest designer on Everyday Cricut! What a great card. I'm sure he will love it :) I'm not sure if I'm ready to try a waterfall card, but thank you for directions. I really liked the layout of your daughter, and the Toy Story layout, but I think the mother's day card might be my favorite! Thanks for sharing all of your beautiful work with us! Thanks from all the Irish crafters!!! You did a great job as guest designer at Everyday Cricut. This waterfall card is great but I think my favorite was the Mother's Day card. Thanks for your time this week. I've enjoyed all your projects. You rocked the week at Everyday Cricut. Everyday Cricut Day five is fabulous. Thank you for the tutorial! But my absolute favorite day was day four. Not only was your page absolutely gorgeous (I need that cart), I totally understood where you were coming from. My son was only 7 when we saw the last Toy Story and I cried so hard too imagining him growing up and moving out. Sniff, Sniff. What a great week of ideas!! Everyday Cricut Day 5 is great. Loved all your creations. It's hard to pick just one. When I finally get back to my crafting space I plan to try several of your ideas. Always need help getting the Imagine going!! I just LOVED the waterfall card. The Irish in me made that my fave! I loved all of your projects! But, I especially liked your St. Pat's card, from my Irish heritage! Your directions on your projects were terrific! Thanks for sharing! Choose just ONE? My favorite thing this week was reacquainting myself with you and your blog; I hadn't visited in recent weeks. As for the projects, I enjoyed them all, but I'd say the Shine layout was my favorite. I'm always looking for new layout ideas, and I plan to scraplift that one. And thank you for generously providing the Gypsy files for us! great card and thanks for the file. i will def. use it. my favorite this week was the toy story layout, as stated before i am a toy story freak and that layout just looked so real. thanks for sharing everything and for the chance to win. 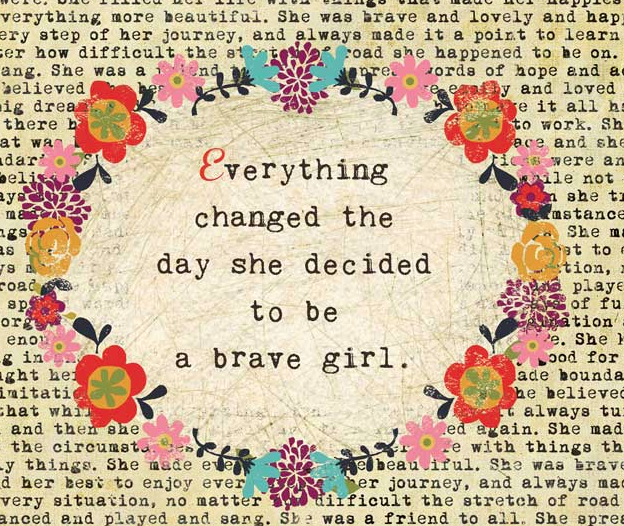 Maria, thanks for the cute ideas this week, and for sharing the gypsy file for this one! Everyday Cricut Day Five, all of your projects were really nice. I was in awe of the Toy Story page you did. That really turned out nice and would have to say that was my favorite but it's hard to choose. I loved that card with the bees too!! Thanks for the chance to win! TammyK. My favorite project you did this week on Everyday Cricut was the "Shine" scrapbook page. Simply beautiful!!! I must admit though the St. Patrick's day waterfall card is a close second. I hope your father-in-law likes it too. You do gorgeous work! 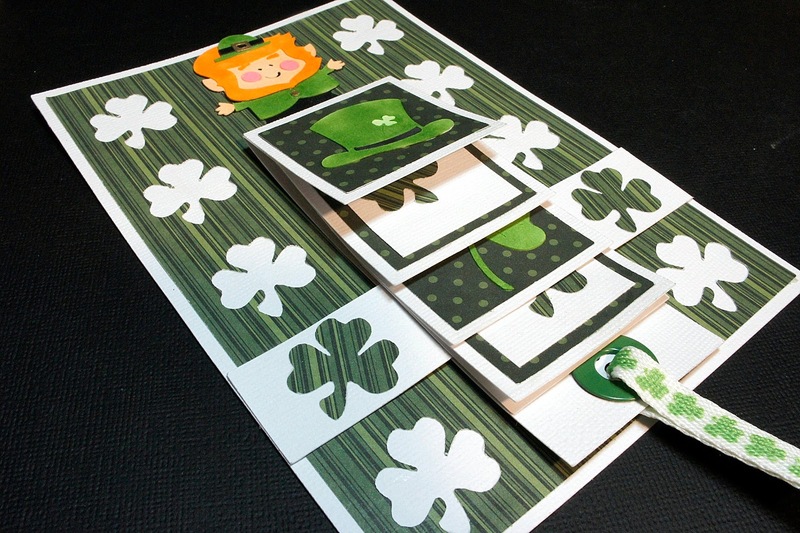 My favorite is the waterfall card (for St. Pat's) I've never done one and think I'll have to try it now. Going to be following your blog now. thank you for sharing your projects this week. I think this waterfall card is my favorite, I can't wait to go try it out. Wonderful projects this week! I loved your waterfall card. It's new to me and I thought it would be fun to try this one. Thanks for all the great ideas over on Everyday Cricut. Thank you for your time and all the things you did for us this week. I downloaded your file for the Gypsy and sure I will use it. Please come back and visit us. See you at The Pink Stamper hop! I liked everything this week of course, but I am going to pick the Toy Story LO. These characters have been apart of my childrens whole lives too! My daughter runs track, and I say to her "run like the wind, bullseye" it almost always gets a smile from her!! TFS all your wonderful talents. Well Maria, you've just done a bang up job hosting this week at Everyday Cricut. I've enjoyed each of your projects, but today's is my favorite. I've been procrastinating getting one of those waterfall cards made up. Now I have one less excuse after your wonderful directions. Thanks for all your inspiration. Thanks for all of your wonderful ideas. I will continue to follow your work. I would have to say that I enjoyed your day 5 post the most! I haven't really seen very many projects to do with St. Patty's day and are this cute and fun! Thank you for your inspiration and all of the great work you did on your projects! I loved the waterfall card! I would have never thought of that on my own. Thanks for sharing! I just recently got a cricut so I've been searching the Internet for ideas, and haven't seen anything like that. Thanks for sharing! Hi Maria, I have loved all your projects this week, but my favorite has got to be the Mother's Day card usinng Kate's ABC's. I really love this cart. Oh, Maria, everything you've done this week has been wonderful. I'd have to make it a tie between the Imagine layout of your lovely daughter and the Toy Story layout from yesterday (yes your son is handsome too ;- ). Thanks for sharing your week with us. Hi Maria I loved all the projects this week but especially the Toy Story layout. Thanks for sharing. I am thoroughly loving your stuff! I have really enjoyed seeing your creativity on Everyday Cricut this week. I love this waterfall card you have shown us today. Everyday Cricut Day 5 Maria,Loved all the projects you have shown along with the techniques. Thanks for the gypsy file for the waterfall card. Love that and can't wait to try it. My favorite is the Toy Story page. We all love Toy Story too. I did cry during the third movie too. I liked all of the projects this week, but I especially like the bee card. I also liked the tip on the toy story card that sadi to leave all of the pieces on the mat and just take one piece at a time off as you ise them. Everyday Cricut Day 5 - Marie, your week giving us Cricut ideas has been super and I love that you include great hints and techniques. The waterfall card for day 5 will be at the top of my list for projects my youngest granddaughters will enjoy making. Thank you and I'll be watching for your return to Everyday Cricut. What a creative St. Patty's Day card! All your projects this week were awesome but my favorite was the Woody & Jessie layout. Very detailed. Thanks for the opportunity to win a cartridge. Take care! Toy story was my FAVORITE! I just got this cartridge and was excited to see that you did a project for it. I love the wood grain idea. Thank you. My favorite was Tuesday, your daughter's layout. It is so feminine and pretty, just like your daughter. You also gave great details that helped me understand the Imagine and its capabilities a bit more. Thanks Maria. Am a follower so i can keep up! My favorite was definitely yesterday's. Love all the special touches you did to make it look so real. Thank you for all the inspiration, I love all the projects but, by far my favorite is the toy story it is such a cute layout ! Love the waterfall card! Never seen anyhing like it! Hi Maria: Thank you for your daily inspirations however my favorite project was this last one - the waterfall tutorial as I always seem to have a problem. I cannot wait to get home tonight to try this out. Thanks for sharing and hope to see you as a guest again sometime. Hi Maria. Everything from this week has been awesome. I'm so glad I found your blog through everyday cricut. If I HAVE to pick one, I have to say, it's going to be the Toy Story layout. I really like this waterfall card, this is a first for me,since Im pretty new to cardmaking! Thanks for your inspirational week at Everyday Cricut! Enjoyed it very much! Everyday Cricut Day 5 ~~~~~ Hello back again : ) I have to tell you too that I just love the SHINE Layout that you have posted on day #2 . . . Thanks for all the inspiring projects that you have made and shared. thanks for a great week at everyday cricut. i've become a new follower after seeing all your creations this past week. I love them all but....being Irish have to vote with day 5! I was glad to know there are Irish things on cricut cartridges. I have often thought they need one with all things from Ireland. How Funny! I love your story. My mother's name is Maria, she is half Greek and half Irish. Our family is the same. I always tell everyone "My Big Fat Greek Wedding" is exactly how our family works except St. Patty's Day. Thank you for all your wonderful ideas! I have been wanting to try a waterfall card. Thanks for the gypsy file. My favorite project these week was the toy story layout. Great card! I have enjoyed you on the everyday cricut site and enjoy reading your blog and seeing what you will create next. Being a new Expression user, I am still learning and your tips help! The Cricut bug certainly bites when you see so many great things that can be done with the Gypsy, Imagine, Cuttlebug and other accessories! The Toy Story LO is my favorite! I like all the tips you gave on cutting the layers and the embossing for the wood grain! Thank you for filling in at Everyday Cricut. Your projects for this week were wonderful. Thank you for sharing. Everything was so cute! Love the St. Patrick's card because of the waterfall effect, love Shine because of the frame, love Toy Story because of the different techniques and intricacy, and Bee Happy for the postage stamp shape background, and finally, Mother's Day because of the variety of fonts. Ironically, I don't have any of these cartridges or a Gypsy, but I can use your ideas for other applications. How do I choose just one Fav. Ok I will try. I really liked the Woody and Jessie layout but I also thought the bee card was adorable too. I can't choose all of your work is beautiful!!!! Still not sure I understand how the waterfall works but I love the concept. You are very talented. I forgot to mention "Everyday Cricut Day 5"
Its been a great week at everyday cricut, I am now a new follower I love your work!!! Hi Maria! I really have enjoyed your posts on Everyday Cricut and am so glad that I found you thru them! I'm now a follower for sure! My favorite was the Toy Story page layout....i love the 'wood' frame! So cool! Keep up the great work and take care! Just got done viewing the Everyday Cricut Day 5 post. I loved all of your posts this week, but especially the mother's day card. I think the colors you chose are perfect and I really like the embossing folder (totally adding that folder to my wish list)you used. Excited to start following you! Thanks so much for sharing!!! I loved your post on Everyday Cricut Day 5. I also loved My Greek Wedding, never laughed so hard. Todays project was my favorite because I love St Pats day. We went to the St Pats Centre when we were in Ireland 2 years ago and it was soooooo interesting. I have enjoyed all of your projects this week but my favorites were the Imagine layout and Toy Story layout. Since I am making autograph books for my daughter and niece for our upcoming trip to Disney World, your tip about keeping all the pieces on the mat will certainly help me out. I liked the Mother's Day card best but really like the waterfall card too!! Thanks for the chance to win. Have enjoyed this week and the projects you shared. Love todays card!! Thanks for the gypsy file too! Everyday Cricut 5 I love this card never thought of the waterfall effect. I have to say though that you have inspired me to buy the Toy Story Cart. I love it and that was the movie that my husband and I met at!!!! You are so very creative. I am so inspired. Thank you. Got To Smile!!!!!!!! Hello Maria! I have enjoyed "meeting" you and seeing your projects this week. Do you really have to leave??? You are so talented and I've honestly enjoyed looking through your blog. I'm a new follower and look forward to visiting you daily! 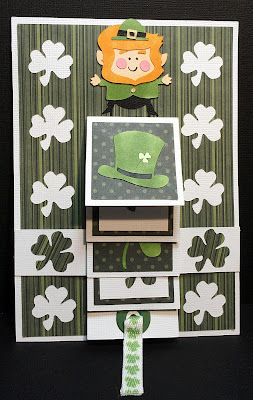 Okay...my favorite project (actually it's 2) are the cards you made "Bee Happy" and today's card, St. Patty's Day. I'm Irish so there is no way I can leave that card out of my favorites! Thanks so much for being the "Hostess with the mostess" at Everyday Cricut. I probably wouldn't have found you and your blog any other way! Great card, including instructions. Great job on the DT. Thanks for the giveaway. My favorite is the St. Patrick's card from Day 5. I like it because it is different than any I have seen. Everyday Cricut Day 5 - I really like today's St. Patty's Day card. Maria, it has been a pleasure getting to know you! Thank you so much for your time at Everyday Cricut! I've become a follower and hope to stop by often. I loved the first day you shared with us! Mother's Day card was the best you card you shared with us, with a close second of Shine with your daughter. Thank you Maria, and I wish you continued success! I love all of your things that you did this week, but my fav is the St. Pat's day card. I love waterfall cards! I first want to say how much I have enjoyed your projects. My favorite is the shine layout because it has shown me what I can do with my imagine(that is in the box still) and also I have teenagers and its nice to see a beautiful layout for an older child. I must say that I also loved the wood frame technique from your toy story page. thank you. The card is perfect for St. Pat's day! Thanks. I haven't done a waterfall card in forever! It's pefect. This card is great! I love it! Thanks so much for sharing your talent I am now a follower on your blog!! Thanks for the opportunity to win!! Thanks for a great week! My favorite project was the Day 3 Bee Happy card. I enjoyed all the detail and liked that you used the Gypsy. I've had mine for some time now & rarely use it. I'm now encouraged to pull it out and get creative. Thanks! Texas Cropper says - Everyday Cricut Day 5 The Toy Story Layout was my favorite project, but they were all great..
Love all of your projects this week, you make it really hard to pick a fovorite one but...lovin the St. Patricks Day waterfall card. Thanks for the cut file also..so generous of you! All your projects were awesome! I particularly liked the Irish waterfall! lol I am Irish so I guess I am partial! Great fun...all week! Loved all your projects! But especially love this waterfall card!! Love that little Leprechaun!!! Too cute!! My favorite project is the waterfall leprechan card with the bee happy card a VERY close second. Love them both!!! Thank you! So, so cute. Thanks for sharing this week. I'v really enjoyed all your projects.